This 1963 Chevrolet Corvair features the RPO 690 code Spyder package, which starting in 1962 was offered on only top of the line Monza Club Coupes and limited-edition convertible cars. Sporting a glossy tuxedo black exterior, this Spyder is dressed in red Monza vinyl trim including red vinyl-wrapped bucket seats up front, and a bench seat in the back. The contrasting white soft top gives this sports car a very eye-catching look. The red boot cover tucks the soft top safely away and blends in with the interior when being used. The most noticeable difference between the basic Corvair and this performance edition can be seen in the vastly different instrument cluster. Displaying slightly different engine gauges, it also features a 120-MPH speedometer with trip odometer and a 6,000-RPM tachometer. Equipped with a four-speed manual transmission and a performance-oriented 3.55:1 gearset the Spyder left the factory with a polished new turbocharger mounted neatly above the engine. This configuration, pulling air through a single Carter side-draft carburetor, allows the turbo's 3-inch turbine impeller, capable of withstanding 70,000 RPM, to produce up to 10 pounds of boost and pushing, a normally 104 horsepower engine, up by nearly 50% to over 150 horsepower. Sporting the turbocharged engine, the correct wire hubcaps, and a newer interior, it comes ready for your enjoyment. This beauty hails from a very respectable collection where it was under a watchful eye and comes complete with its owners’ guide, receipts, sales photo and brochure. An example this nice is sure to please. Introduced in 1960, the Chevy Corvair shattered Detroit's conventional car mold becoming GM's first unit-body mass-produced car in US. This was also America's first post war car to feature independent suspensions on all four corners and a first rear-mounted air-cooled engine in domestic car. 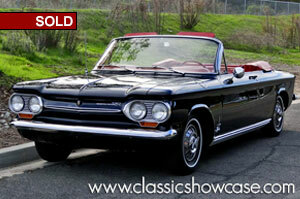 The Corvair quickly took its place as compact that fit snugly into a rapidly growing market of V8 muscle cars. The 1962-1964 Chevrolet Corvair Monza Spyder’s were produced in limited numbers and proved that Chevrolet was willing to take chances by designing an efficient, high-performance sports car with a simple, yet effective, turbo charger that offered a fair bump in power. This model debuted to great accolades simultaneous with so many of GM's innovative firsts: fully independent front and rear suspension; unibody design; and GM's only attempt at a rear-mounted air-cooled engine, available with their first production turbocharger. Weighing in at roughly 2,500 pounds, the basic Corvair configuration remained the same since 1960 which means this Spyder convertible retained the body's 108-inch wheelbase and 54.5-inch track width. Combine that with its sub-frame construction, allowing for a much lower center of gravity, and you have yourself one great handling and responsive little hot rod - regardless of what Ralph Nader says!